How time flies! It seems like yesterday that I was participating in my first Secret Recipe Club post, yet now I am on my third month of participating. If you have not heard of the Secret Recipe Club, you must check it out. Amanda has even set up a fan page. Our hostess for Group C is Angie from Big Bears Wife. This month I met Evelyne, virtually through her fun blog called Cheap Ethic Eatz. She began her love of food at the early age of eight and by age fourteen she was having her friends over for multi course meals. Now that is impressive. She resides in beautiful Montreal (on my bucket list of cities to visit) and appreciates the variety of cuisines her city offers. She even started a dinner group with blog’s namesake - certainly impressive. While browsing through her extensive recipes on her blog, so many was eye catching, this made it hard to select. However, one jumped out at me. I have long wanted to make homemade marshmallows and she highlighted Thomas Keller’s version. She was inspired by another blogger, Aimee from Under the High Chair. 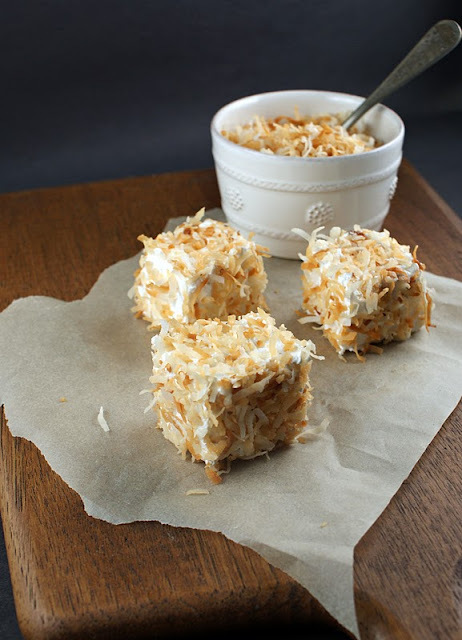 Aimee did the basic recipe and one with toasted coconut. 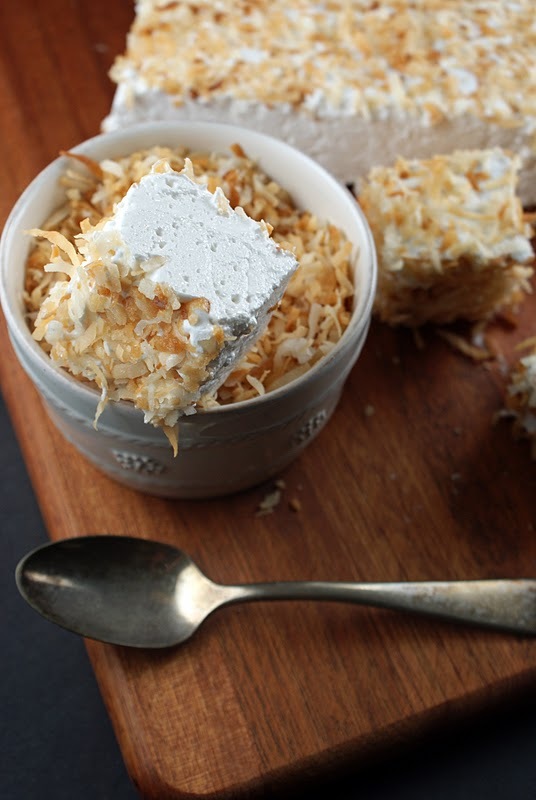 I adore toasted coconut, so I decided to add that flavor profile to a basic vanilla marshmallow. While shopping in San Francisco a few months ago, we stopped it the world famous store – Gumps. While perusing through the gourmet section, the coconut marshmallows caught my eye. Of course, I had to buy them and after one bite, I was hooked. Now that I have accomplished my goal of making homemade marshmallows, I can venture to make more exciting flavors. Thank you Evelyne for the inspiration. 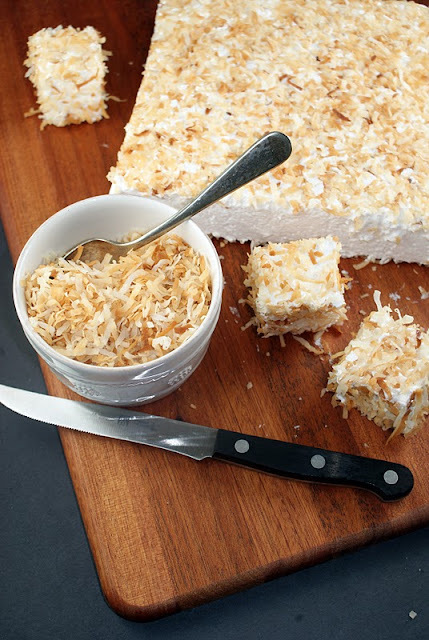 Toast coconut on a baking sheet in oven, stirring occasionally, until golden, 7 minutes. Remove from oven and cool. Break into smaller bits with your hands. Combine sugar, corn syrup, remaining 1/4 cup water, and slat in a 1- to 2- quart heavy saucepan and heat over low heat, stirring, until sugar has dissolved. Bring to a boil over medium heat. Insert thermometer and boil, without stirring, until it registers 240 degrees. Remove from heat and let stand until bubbles are gone. With mixer at low speed, pour hot syrup into gelatin in a thin stream down side of bowl. Increase speed to high and beat until very thick, about 15 to 20 minutes. Add vanilla and beat for 1 minute more. Spoon marshmallow mixture over toasted coconut in baking pan and press evenly with dampened fingertips to smooth top (it will be very sticky). 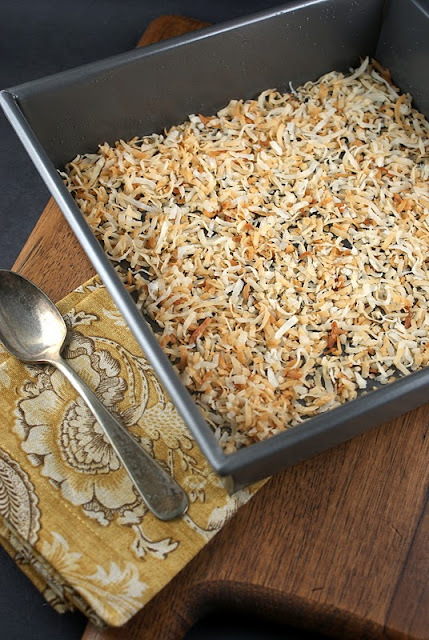 Sprinkle top evenly with 1/2 cup toasted coconut. Let stand, uncovered, at room temperature until firm, about 2 hours. I put into the refrigerator for about 15 minutes to help it set and then took it out. Cut into one inch squares and cover the sides with the remaining toasted coconut. Store in an airtight container. These look amazing! There's nothing like homemade marshmallows -- they make it hard to return to the store-bought kind! I have never thought about making my own marshmallows but with the addition of toasted coconut I want to try this recipe now. These look so delicious. I have been dying to make homemade marshmallows. This was just the inspiration I needed! 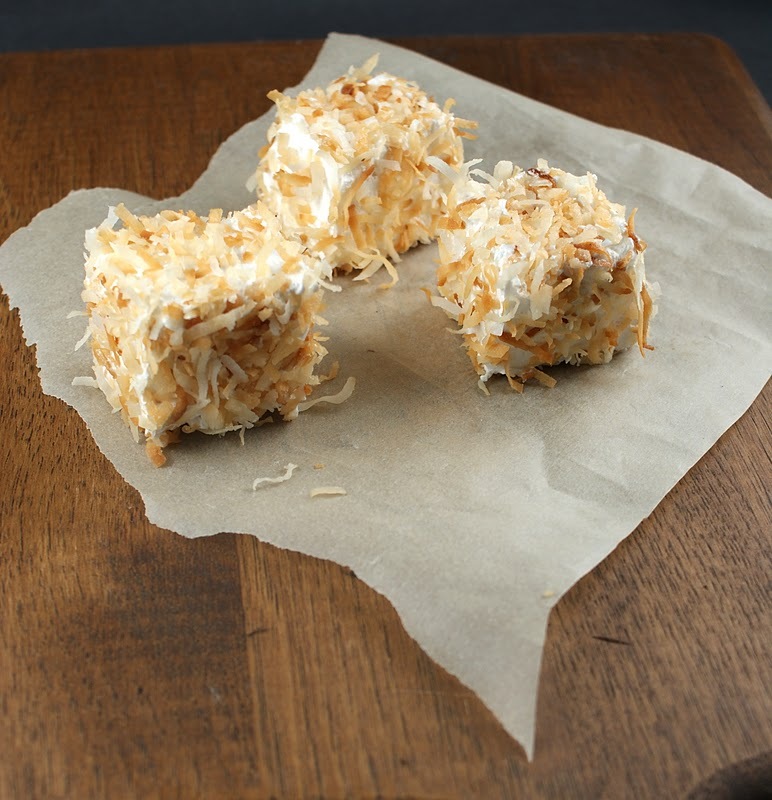 And with the toasted coconut, how absolutely delicious!! So cool your marshmallows turned out just gorgeous. So happy you found lots of inspiration. Yes you HAVE to come to Montreal...and let me know when you do. I've been to SFO 3 times...love it. I've made homemade marshmallows once, and I loved them but not the mess! You could even tint the coconut for holiday flair and gift giving. Great photos! Wow wow wow! I've had marshmallows on my list to make for some time and these look just out of this world. Evelyne has a wonderful blog. You picked a great recipe. Thanks for sharing with us. I've always wanted to make homemade marshmallows and these look delightful. Thanks for sharing!! I love homemade marshmallows, you make it look so easy. Could you flavor them with other extracts? We were just talking about that, trying coconut extract instead of vanilla. I bet it would be good. These are beautiful. The coconut on the homemade marshmallow just sets it over the top. Beautiful SRC post! I tried making marshmallows once (long story), but these look delicious! Great SRC post! I'm pretty sure this is my favorite food I've never had! Great pics! Gorgeous photos, delicious recipe! I bet that pan of marshmallows didn't last long! These look fantastic. I've always wanted to make marshmallows too, but have not got down to it yet. I'd love to try this out! Great pick for this months SRC! What a fun recipe! 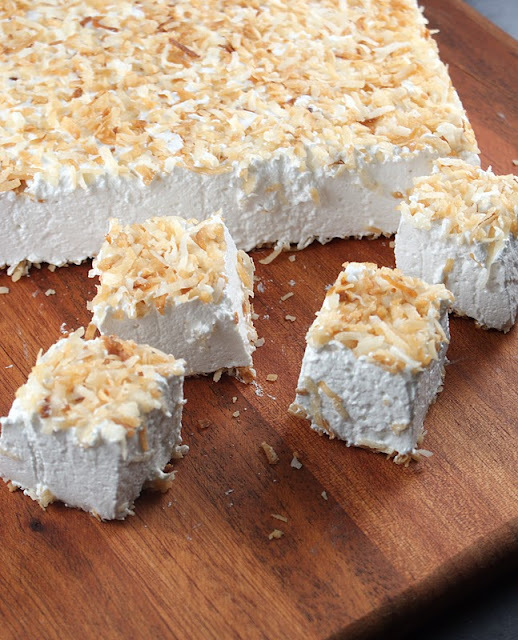 Your marshmallows look lovely with all that golden coconut. The coconut puts these over the top! Wow oh wow, Lisa. Your marshamallows look so lofty and PERFECT. I must add this to my to-tackle list!! I have always wanted to make marshmellows but thought it would be hard. Your recipe with the coconut did it for me. Loved it! I love homemade marshmallows!! A favorite a christmas!! Yours look great!! I tried making marshmallows before and they sure didn't turn out like this! I love the addition of coconut. Yum! Hey Lisa- I've been wanting to make marshmallows! Making marshmallows are on my list! I love the coconut you put on yours. What a cute idea, this secret recipe club is. Hope you are having a great week. These look awesome, and what gorgeous pictures! I'm heading over to check out the Secret Recipe Club - - it sounds like lots of fun! What a brilliant idea of using coconut shreds as a coating! Hi Lisa, that's a wonderful one!, looks so beautiful, love coconut very much, thank you for visiting me, this is my first time here, you have a lovely space, can we substitute corn syrup with anything else as I haven't seen corn syrup here..or does it have any other name..
Yum! 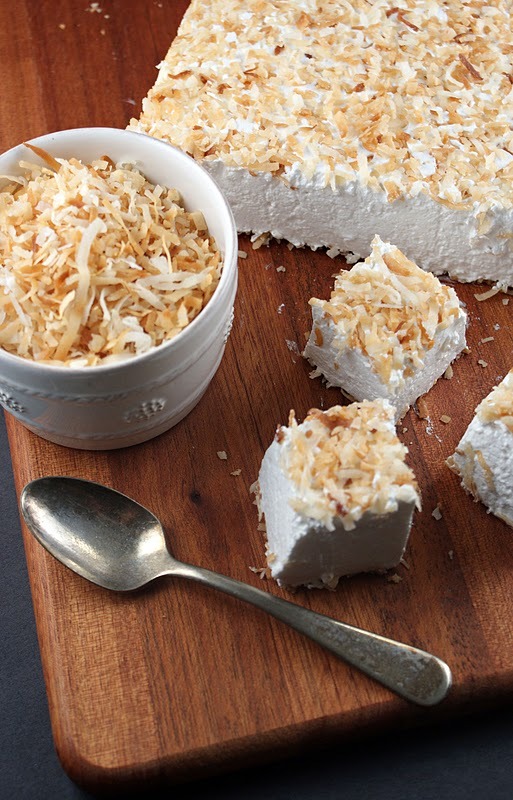 Love all the toasted coconut all over these! Oh my! These look amazing! I think I need to dip them in chocolate first then add the coconut! I'm such a coconut freak!!! Yummi,have to try this.Maybe cherry´s as well? Hi Lisa - I would like to make tinted marshmallows. At what stage could I add a small amount of color paste gel? Hi, I am wanting to make these for Christmas gifts along with homemade hot chocolate on a stick, and am wondering how long they will last unrefrigerated...in a bag? I have had these bookmarked for ages, and just bought everything to make them. It would be nice to get them made sooner than later. Hello - it has been a while since I made these, but if my memory serves me correctly, they were still tasting fresh after a couple days. Good luck!!! I was wondering how long these will keep for. I am making them for Christmas gifts along with homemade got chocolate on a stick. Do they need to be refrigerated?